On Tuesday, Brent prices fell around 4%, as Saudi Arabia said it can supply more crude oil and that too quickly if need be. 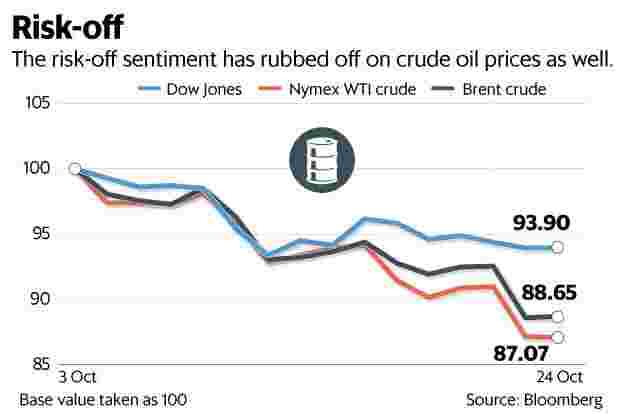 Mumbai: It took just 20-odd days for Brent crude oil prices to drop to $76 a barrel from $86. What has precipitated this sharp drop? Cast your eyes on the chart. It shows that both US equities and crude prices have fallen in tandem. The correlation suggests a risk-off sentiment in the markets, which is rubbing off on commodities as well. Additionally, this is also an environment where interest rates are rising and that’s typically bearish for commodities. On Tuesday, Brent prices fell around 4%, as Saudi Arabia said it can supply more crude oil and that too quickly if need be. This is helpful considering the looming US sanctions on Iran, which start on 4 November. Commenting on the plunge in oil prices early this week, Peter Kiernan, lead analyst, energy at The Economist Intelligence Unit, said, “Once sanctions formally begin on November 4th, further Iranian oil supply loss is of course on the cards, with the only question being to what extent this will occur." But competing with this in terms of market sentiment will be growing concerns about global economic performance next year, added Kiernan. Investors should watch whether output from the US and Opec and its friends is able to compensate for supply shortages from Iran and Venezuela (sharp production declines due to economic crisis) from a medium term perspective.